Kiran Acharya, Associate Producer of film will join us that evening and take part in the discussion of this Inspiring film that explores the agenda behind the neglect, demolition and regeneration of council estates in the U.K. over the past thirty years. It reveals individuals and communities fighting against the state and private developers, as they try to save their homes from demolition, and investigates the decisions that turned a crisis into a tragedy.In 2017 housing tops the British political agenda for the first time in a generation. But despite the media spotlight, few stories examined the catastrophic long-term failures and agenda that resulted in a chronic shortage of social housing in the UK as have these filmmakers. 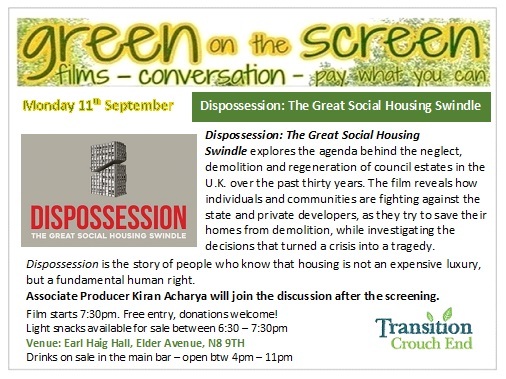 This film calls upon our Augur capacity to see beyond what is in front of us and is fiercely relevant locally where the 'The Haringey Development Vehicle '(HDV) is considered the biggest privatization and ‘regeneration’ of Council property project currently being proposed in the country. StopHDV campaign have called a London-wide march for 'Social Housing NOT Social Cleansing' on Sept 23rd in an area that is earmarked for demolition and social cleansing. Film At Earl Haig Hall. Elder Ave N8. Doors open 6.30pm, film 7.30pm. Light snacks available before film for donations. Drinks available in main bar. Free Entry. Donations warmly welcomed.